[Episcopal News Service – Dallas, Texas] Episcopal News Service spoke with the Rev. 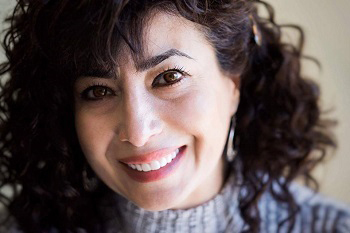 Samira Izadi Page, founder and executive director of Gateway of Grace, about her life, fleeing Iran in 1989, her journey to the United States a year later, and her ministry during a recent interview at her office in Dallas. Gateway of Grace is a ministry that mobilizes Episcopal and other churches to bridge sociocultural gaps, and remove the fears, anxieties and spiritual apathy that stand in the way of Christians connecting with refugees. Gateway partners with more than 50 congregations to adopt refugee families upon arrival, and provides job readiness, language and other trainings. On Wednesday nights, Gateway of Grace hosts Grace Community, providing a space for fellowship, prayer, worship, a meal and Bible study for Christian refugees who fled persecution in their home countries, and Muslim refugees who are interested in learning about Christianity. The community includes refugees from 16 countries — including Iran, Iraq, Afghanistan, Cameroon, Syria — and six religious backgrounds. In February, when the Trump administration first announced its executive order suspending the refugee resettlement program and restricting travel from seven majority-Muslim countries, Gateway of Grace initiated a 30 Days of Prayer for Refugees campaign. Many of the refugees served by Gateway of Grace have family members and friends whose lives are in limbo. You have an incredible story. Can you describe briefly your journey from Iran to the United States, what drove you to flee your country and seek political asylum? My ex-husband was a Sunni Muslim, I was a Shia and he was persecuted. It’s a very long story, but one morning I was working on my Ph.D. and there was a knock at the door and when I opened the door life as we knew it just ended. The intelligence service came in, they tore the house apart and they found a copy of Salman Rushdie’s “[The] Satanic Verses” and that was basically the end for us. My husband, lucky enough, wasn’t home, but they took everything that we had at the house and they shut down his business, they shut down our accounts, and we escaped Iran empty-handed, walking through four feet of snow over two nights with two kids. We nearly froze to death. Who: An Episcopal priest in the Diocese of Dallas and founder and executive director of Gateway of Grace. Professional background: Bachelor’s and master’s degrees in philosophy earned in Iran. Attended seminary at Southern Methodist University: Master of Divinity and Doctorate in Ministry focused on missional church studies. Ordained a deacon in 2010; a priest in 2011. We went to Turkey. My husband’s brothers sent us money from Dubai, and we hired smugglers and they took us from Turkey to Mexico, and they left us in the middle of Mexico City with nothing; less than $500, no documentations, we had nothing. On the 10th day that we were there I saw a store that sold oriental rugs and I thought that may have something to do with Persian rugs so I went up to the store and I said, “Do you have any Persian rugs?” By my accent, he immediately knew I was Iranian. He started speaking back Farsi and I started crying. I said, “Stay right here, I’m going to get my husband,” and as soon as he came up he said, “Aren’t you the son of Mr. so-and-so?” That guy’s father had been my husband’s tenant back in our hometown. What are the odds of meeting someone from your own country of 60-some million, your hometown of a few million, whose father had been your tenant, in the largest city in the world on the 10th day? Every step that we took it was like that. We were there for a year, it’s a long, long story, but then we crossed the border at New Laredo and walked through the river and turned ourselves in at the immigration post and applied for asylum. They said, “Where do you want to go?” My husband said, “Dallas.” It was really random. I wanted to go to California because that’s where most Iranians are, but my husband said, “Let’s go to Dallas.” It was a God thing really. And we got to Dallas at 7 a.m. and I thought, OK, we are going to have a job and an apartment today. A cab driver took us to Motel 6 from the downtown bus station. I saw Yellow Pages, which I had never seen before. I started looking for apartment locators, started calling, found out we couldn’t rent an apartment because we didn’t have Social Security numbers or jobs. I saw Islamic center, so I called them up and they said that they couldn’t help, but they knew of a lady who worked with refugees. They gave me the number, I called the lady and she sent someone. By 9:30 this guy was at our door and he said I have an apartment, I’m not sure whether you are going to like it or not. He took us to a two-bedroom, fully furnished apartment. By 11:30 we were in our own apartment. We had done our grocery shopping. We had paid a month of rent in a city where we didn’t know a soul; without documentation. Now, these people, they were Christians, but they worked with Bosnian refugees who are Muslims. That’s how the mosque knew of them. They had prepared that apartment for a Bosnian family that was supposed to come a month before us. They never showed up, so it was just sitting. We walked right into it. When I told this man about my interest in Christianity he said, “Well why don’t you all come to church with us?” We went. It was a Baptist church, and I was baptized just six months later. You were eventually given refugee status. Would you say your journey was typical or atypical? It was atypical because refugees usually come in with full legal status. They come in with Social Security cards, they get work permits, but we had nothing. It was extremely difficult. That’s why I have so much compassion for refugees because I know where they’ve been. You were born into a Shiite Muslim family and you married a Sunni Muslim. How did your family react to your conversion to Christianity? My family was nominally Muslim, so there was never a conversation about religion at home. But my mom knew that I had a vision of the Virgin Mary when I was 6, so when I told her when I was about to be baptized, I called my mom and I said, “Mom, remember my vision?” and she immediately knew what I was talking about. I said, ‘Well, that’s happening,’ and she was happy. She is now a Christian; she was baptized about a year and a half ago, and now she’s being persecuted in Iran. How did you find yourself in the Episcopal Church? [By the] second year in seminary I knew that I couldn’t be a Baptist because of the sacraments and the understanding of ministry. My understanding was somewhat more ontological, who I was, rather than the function of, and the director of spiritual formation at Perkins was an Episcopal priest, Father Fred Schmidt. He is now at Garrett [Evangelical] Theological [Seminary]. I shared my testimony with him, and he said, “Well, have you considered joining the Catholic Church?” because of the vision of Virgin Mary. And I said, “Well I have a call to ministry,” and he said, “Well, why don’t you come to my church and visit.” I went that Sunday. And years and years ago, when I was 14 or 15, I had this dream and in that dream, I was thirsty looking for water. I was in a room that was in the shape of a hexagon and it was all marble and it was enclosed and I went round and round, and there in the middle of the room was a font. That stayed with me, and here I am many years later in the United States, becoming a Christian and I’m entering this church, Church of the Incarnation in Dallas. And I’m late and I have no idea what the Episcopal Church is and so I was kind of intimidated, and I enter through the back door, kind of the side door, and as I entered the first thing that hit me in the face almost was that font that I had seen in my dream. That’s how I knew I belonged there. Where did the idea of Gateway of Grace come from? When my curacy was coming to an end I started praying asking God what it was that he wanted me to do. And as I was praying through my life, it’s not like there was shortage of clergy here for God to bring an Iranian woman with an accent to serve at the parish, because as wonderful as that would be it would have nothing to do with my experience, what God had taught me through those experiences. So, I started to look at the refugee population, and at that time I had already worked with refugees for a couple of years. And I started looking at what was available to them, and Texas was the largest hub for refugees up until last year and now it is second to California. And I noticed there were churches that were doing holistic ministry, like the Baptist church that adopted me kind of intrinsically, and then there were churches or refugee organizations or ministries that were very secular: They would just give refugees stuff or help them, but they wouldn’t want to talk about the spiritual matters. Then there were, on the other side, people – “Are you saved, do you know Jesus yet?” And then there were a lot of programs but there wasn’t any systematic way of mobilizing churches to do a holistic type of ministry that would address not only the practical needs but also the emotional and spiritual needs of refugees. When we were praying about the name we thought, well, what is the one thing that distinguishes Christianity from all other religions, and that’s grace. And the instrument that God uses to communicate that grace into the world is the church, therefore, the church is the gateway of God’s grace, so Gateway of Grace. How did you end up focusing your doctoral thesis on decreasing anxiety and fear about refugees among Christians? When I got my doctorate, I wanted to do something that was relevant to the work I was doing and I wanted a very systematic, very Anglican kind of Episcopal way of removing fears and prejudices and spiritual apathy. Those are big issues, at least here in Dallas, just the unknowing. The idea was how do we use scripture, tradition, reason and social studies, all that we have in our church to address these issues specifically, and move them from the place of fear, anxiety, hatred, anger, unknowing to engagement in God’s mission through ministry to refugees? Why do you think Christians (Americans) harbor so much fear and anxiety? Well, part of it is the media. The media provides, whether it’s liberal or conservative, Republican or Democrat, or anything in between, they each provide a slice of reality. They don’t provide the entire pie of reality, and while those realities are factual, they are not the entire picture and thus they form an alternative reality that’s not accurate. But people who are not familiar personally with refugees, they buy that because that’s all they are introduced to, so media is a huge part of it; the way they present the issue. In your experience have you found that alleviating those fears comes through compassion and acceptance and is that possible only through personal relationships? So that’s what my thesis is about. It’s a whole workshop, it’s a whole process of how do we address those issues, so I use ancient prayer methods, social studies to kind of address the fears and the concerns and do a spiritual formation and move them from that place to refugee ministry. Unlike in Europe, where disaffected first-generation European Muslims have staged large-scale terrorist attacks, the United States hasn’t seen the same kind of violence. Yet, Americans live in fear of such attacks. How do you address or alleviate the fear that many white Christian Americans express? Not just in terms of fear of the other, but living in fear of a terrorist attack? Because they come with real fear, they see this stuff on television. I think the key is to acknowledge the fear because those fears are real. We had a shooting in Garland, Texas, that was done by a Muslim extremist, shooting [up] a library. So those are not things that are impossible to happen in the U.S., therefore the fears are real, right? But how probable are they? That’s a different question. So far refugee resettlement has been a very successful program and we haven’t had any issues with our refugees. I’m a Muslim background believer and I have a holistic ministry. Part of it is evangelistic ministry to refugees, many of whom are Muslims, many of whom are very conservative, so I understand the fear. So, for them to be able to connect to someone who would just acknowledge their fear and have sympathy for their fear and not just dismiss it, then that’s really the first big step. The other parts of it are, as I do in my workshop, how do we move forward, and that’s through this whole process that we do with our volunteers and it takes time and patience. But I’ve seen people who did not like refugees, did not like Muslims, who are now huge advocates for refugees. The U.S. Refugee Resettlement Program is a public-private partnership and six of the nine resettlement partners are faith based. The affiliate network and the nonprofits working locally also tend to be faith based. Not to compare or say the U.S. system is necessarily better than the European system, which varies by country, but do faith-based partners lead to better rates of integration? Resettlement agencies such as Catholic Charities and International Rescue Committee or other organizations, they have limited financial resources and limited manpower, but in the church, we have all these resources. We have the manpower and the financial resources that we need to minister to refugees, but more importantly refugee resettlement agencies or secular organizations, they provide services, and those are for a limited number of months or until [refugees] get on their feet. But what churches do, they not only add to the services and fill in the gap where services are lacking, but they add Christian care. Services and care are two different things. I think that’s really important for the healing process, for the integration process. And, then on top of that, where these agencies leave off, the relationships that churches have formed, and by churches, I mean individual Christians, they continue to grow, and I think that’s a gift to the refugees that they are able to connect with Americans. Most refugees never come to experience real friendship with Americans, with Anglos, particularly. Gov. Greg Abbot pulled Texas out of the federal Refugee Resettlement Program, which indicates to me that statewide there’s some resistance to refugees. Still, resettlement continues with the federal funds channeled through nonprofit organizations, and Texas is second only to California in the number of refugees admitted. Can you share some insight into the dissonance? Political issues and people issues are two different things. I think the people of Texas are extremely generous, extremely loving, Dallas particularly. Or Texas is a Christian state, and while they might be politically conservative, they have the Holy Spirit in them, and the Holy Spirit moves them to reach refugees and to love them and to serve them whether they politically may agree with refugee resettlement or their political party is supportive of that. Dallas Mayor Mike Rawlings, on the other hand, takes a position opposite the governor. He applauds the resettlement program. I read that one in four Dallas residents is foreign born. What makes Dallas, particularly, welcoming toward immigrants and refugees? How have they helped shape the city? What has helped them to be welcoming, it’s just the heart of the people. It’s not political, they are just good people, many of them just good Christians. It’s a very religious city, so that might have to do with it. Yes. There is a neighborhood in Dallas that used to be very violent. Refugees have been resettled there and the violence has been reduced, but I don’t think and those may be impactful in the ways that political decisions are made, like at the mayor’s level, but I don’t think that individual Dallasites think in those terms. I don’t think they think, what are we gaining from this? I think they just have a good and generous and compassionate heart. The U.S. Supreme Court recently temporarily upheld parts of President Donald Trump’s travel ban, refusing entry to people from six Muslim countries, unless they have a family connection or a university appointment. What has been the impact of the court’s decision on the community you serve? Our refugees are in Turkey. They are mostly persecuted Christians. They are really struggling with that decision because their situation now is unknown and they despair. Many of them are wondering whether they should go back to Iran, and that would be extremely dangerous because these are heavily persecuted Christians. And so it has been a very difficult six months or so for our refugees, anyways, but this recent decision has added definitely for that. So, you have a direct connection to refugees who are awaiting third-country resettlement? Iranians, they are particularly there in Turkey, and my sister and her husband, they are refugees in Turkey right now among others. So, yeah, we have a network of refugees that we connect to. –Lynette Wilson is managing editor of Episcopal News Service. Your story is amazing. Keep up the good work. I’m sure our Lord Jesus has given you the strength eo endure and will continue to bless your ministry. This is one of the most inspiring and challenging stories that has ever appeared in Episcopal News Service. In the face of cruel US government policies, delaying the acceptance of immigrants fleeing for their lives and tearing families apart by arresting and deporting our undocumented sisters and brothers, sincere followers of Jesus must act. Samira is an example to us all. Incredible, inspiring story…how I wish all immigrants were of this calibre and willing to help us help them…it makes me want to join with the organization in supporting them all the way…her grace and courage under much pressure touches my soul and I pray for her success with the organization she is chairing…God’s blessings. I was very impressed by the writer’s story. I lived in Dallas for 24 years and taught many children that were in a sense refugees—Mexican American kiddos. One should not call these people refugees since Texas was once a part of Mexico. The folks add so much to the cultural life of a city, let alone the economy. In those years I belonged to a church in Oak Cliff (south sections of Dallas) that provided sanctuary to an extended family from El Salvador. We learned a lot from this family. Thanks for the article. Keep up the good work.